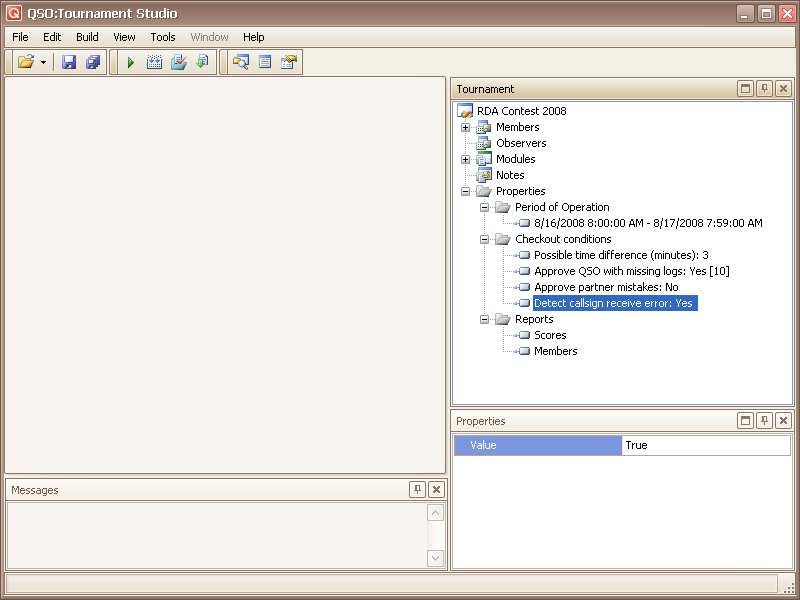 Algorithm options are accessible in elements of "Properties" node of a tournament tree.. 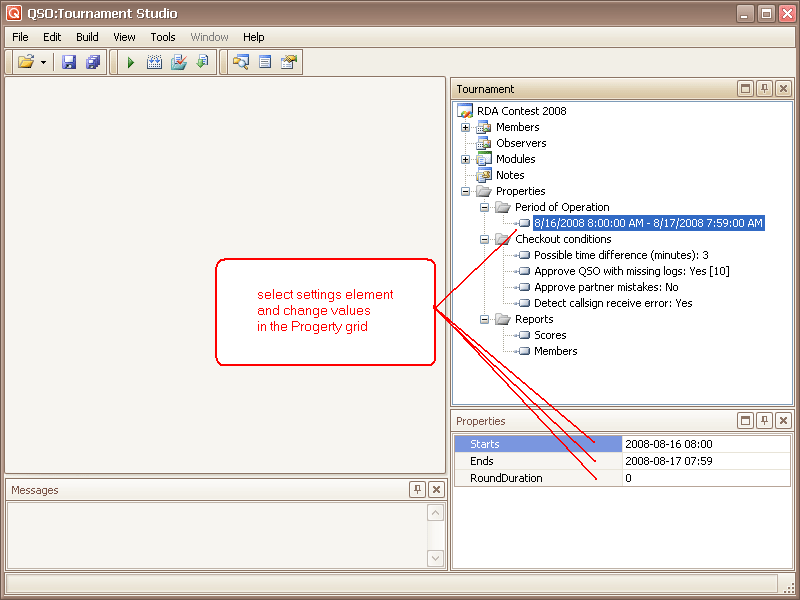 Select an option element, having clicked on it the mouse, and make the necessary changes in panel "Properties". The option element "Period of Operation" contains the description event time of tournament in terms "beginning time" (Starts) "termination time" (Ends) "duration of miniround" (RoundDuration). Properties Starts and Ends descript date and time of the beginning and the competition termination (or round) in format YYYY-MM-DD HH:MM. Property RoundDuration contains duration of miniround in minutes. If value of property is equal to zero - it is considered that minirounds are not present. ATTENTION: termination time enters into competition time, that is the description, for example, "00:00-05:59" designates the communications made "from 00:00 till inclusive" (QSO is considered at 05:59). The adjustment element can contain the description of several intervals. The option element "Possible time difference" contains admissible divergence of time in minutes. Option element "Approve QSO with missing log" descript allow to set off communications with correspondents not sent broad gulls (property Approve value True) and how many mentions of this correspondent in files of other participants for this purpose are required (property RefCount). 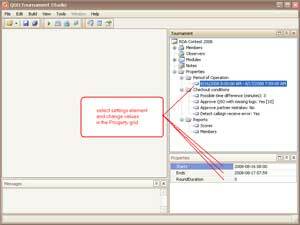 Option element "Approve partner mistakes" descript to allow to set off communications with the correspondents who have committed an error of reception. At value of property Value = True communication is set off in a case if the correspondent has incorrectly accepted control number, at value of property Value = False such communication is not set off to both correspondents. 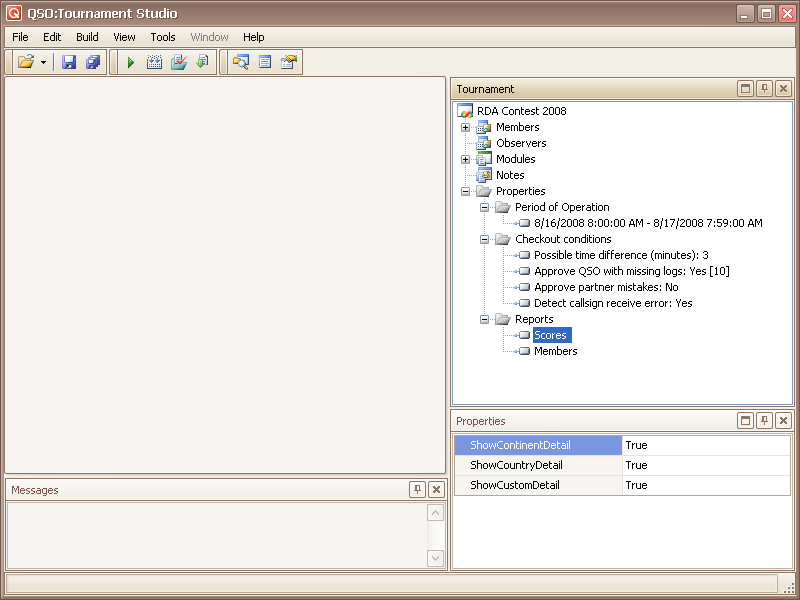 Option element "Detect callsign receive error" influences accuracy of diagnostics of the error connected with a callsign of the correspondent. If value of property Value=False erroneous (or absent) a call sign is diagnosed as NoLog ("member file is missing"), and this record can mean both absence of a broad gull of the correspondent, and an error of reception of a callsign. In this mode the maximum speed of data processing is provided. If value of property Value=True (by default), the program tries to find correspond record for checked communication, and, based on the results of testing, the error of reception of a callsign (Callsign error) separately from NoLog is diagnosed. In this mode accuracy of diagnostics for the account of essential decrease in speed of data processing is provided. By means of option elements has undressed "Reports" it is possible to change a kind of the chosen report. For example, probably to disconnect summary table (property "ShowSummary"), additional groupings on the countries (property "ShowCountryDetail"), to continents (property "ShowContinentDetail") or custom (property "ShowCustomDetail"). Value of property "False" means concealment of the specified detailed elaboration, value "True" - display. Option element "Report" - "Missing files" switches a mode defining accuracy of report formation. In mode "Draft" - high speed for the account of decrease in accuracy is reached. In mode "Fine" - the maximum accuracy.